My Illumicrate box arrived over the weekend – turns out the address I gave was my Gran’s because of the whole moving house thing, so when I went to see her today it was there waiting for me which was rather exciting. Illumicrate is a UK based subscription box for YA book lovers, the box is sent out every three months and you can find all the info about costs and shipping here. This is my second Illumicrate, the first one I bought was February’s box and you can find out what was in it and my thoughts on it here. So now onto this month’s box! The book that came in this month’s box was When We Collided by Emery Lord. I love the cover and to be honest this book hadn’t come on to my radar at all. I’ve not read any of Emery Lord’s books before so this is the perfect opportunity to check her writing out. It seems like a contemporary romance (as you may know that’s not my go-to genre) but it seems like the sort of thing I like to read over the summer. It also came with a signed bookplate and some pretty postcards as well. The goodies were once again really cute and from companies that I’d never heard of. My favourite goodie is the To Be Read List Notepad from Goodnight Boutique. It has sections for your TBR list, what books you need to review and what books you want to buy. I already know I going to use it a lot because whenever I finish a book I hardly ever jot down a few notes that can make up my review so when it comes to when I can sit down to write a review I struggle to remember what I felt about the book. I really do love this notepad! Also included was a mug that says “What Happens In Book Club Stays In Book Club” from The Art of Escapism. It’s a plastic mug which is a bit different but also useful when you want a have a drink and read outside. There’s a stamp from Little Stamp Store, mine has a fox curled up on a pile of books, a “Readers Gonna Read” pin from Literary Emporium and a sweet bookworm clip bookmark from My Bookish Mark. There were also extra bits a pieces related to The Square Root of Summer by Harriet Reuter Hapgood, Mystery and Mayhem which is a collection of mystery/crime stories from different authors, some pin badges for the Ladybirds series by Jenny McLachlan and a sampler of Strange the Dreamer by Lani Taylor. A lot of the goodies included in the Illumicrate box are exclusive so if they sound like the sort of thing you’d like plus a recent YA release then maybe Illumicrate will be for you. I do like the fact Illumicrate is sent out every quarter because I have yet to read Truthwitch which was the book in the last Illumicrate box – admittedly I did pick it up but got barely 30 pages in before putting it down because I couldn’t get into it, I will try again though! 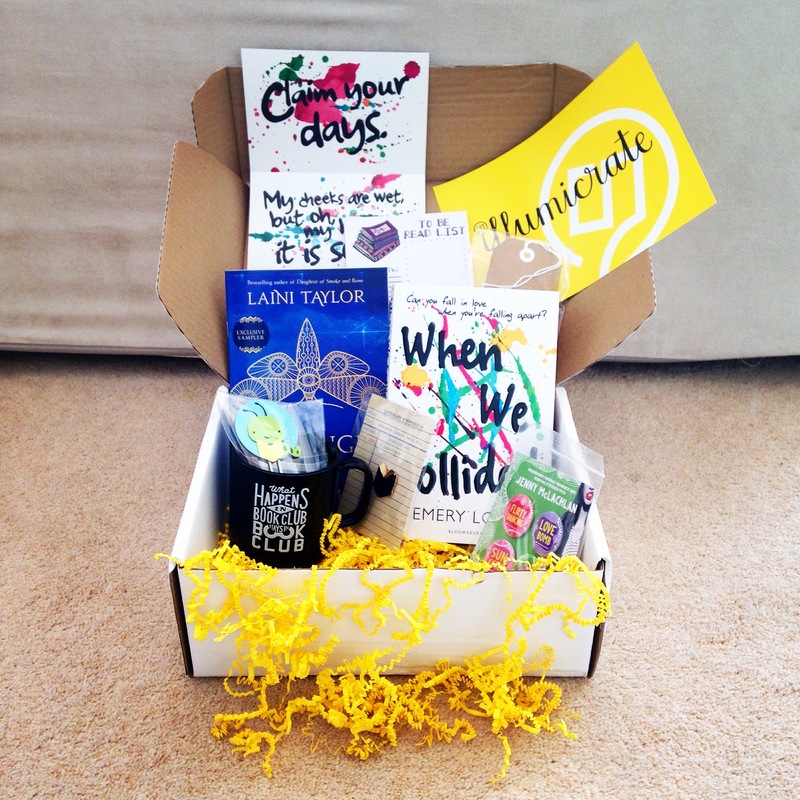 If I’ve read When We Collided by the time I can subscribe to August’s box I’ll probably do it. I just don’t want to end up with a lot of books and bookish goodies that I have read or used for the sake of it. Does that make sense? Have you had an Illumicrate box before or any other type of subscription box? What do you think of them? I’m actually getting a Fairy Loot box for the first time this month so it’ll be interesting to see how their box is set up compared to Illumicrate. Wow — I think what’s most neat is that I know of the individual the mug design came from (well, had a blogging feature with them before). Anyways, what a small world!